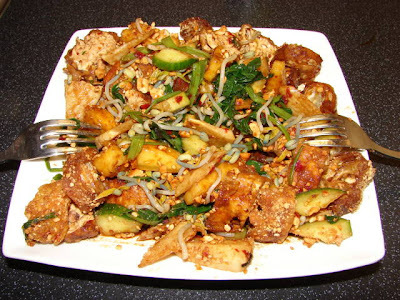 Rojak is a Malaysian/Indonesian/Singaporean/Bruneian snack salad with a black/brownish pungent dressing. This black/brownish dressing dominantly contains a black shrimp paste called petis udang or hae ko (in Hokkien). I have not seen this paste on sale in UK for many years but recently I have seen this brand (picture below) in most larger Chinese supermarkets including online from Wai Yee Hong. This shrimp paste is nothing like the pinkish brown solid shrimp paste called belacan or kapi for curries or stir fried kangkong. 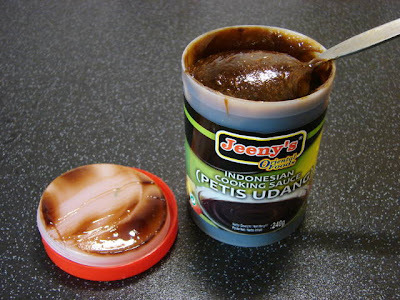 Petis udang's texture is similar to marmite. It is made with a shrimp shells stock reduction and it can be sweet with added sugar or palm sugar. This petis udang I bought recently is quite different from what I used to have in the far east years ago, it seems much browner than jet black and it is a lot more sweeter than I remembered. The taste is ok. 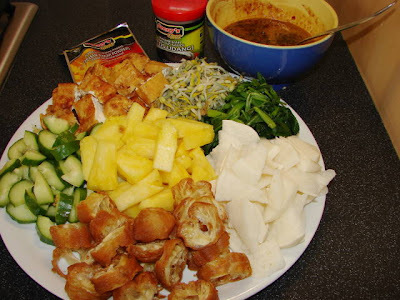 The two common uses of petis udang is making rojak or use a condiment sauce for sour fish assam laksa like this recipe. Rojak is one of my favourite S E Asian snack. The dressing can be a bit pungent, once you got over the smell it is very very tasty. The salad is made with a mixture of fruits, vegetables, tofu, fried bread dough etc.... Some people will add a reconstituted squid like this or another favourite is deep fried prawn fritters. Here is my version without the squid. Recipe will feed two hungry person. See this picture for the salad ingredients. 2 - 4 tbsp of grated gula melaka or gula jawa (both brown palm sugar) or Thai light coloured palm sugar. 2 tsp of dry roasted belacan or dried shrimp paste - optional for a more stronger tasting and umami dressing. I happened to find a ready roasted powdered belacan last week which is less pungent and save the house smelling for days. See the packet on the picture above. * If you are lucky enough to get other S E Asian fruits, you can also add green mango, starfruit or jambu air (rose apple), see descriptions on this post. To make the dressing first mix the udang petis with chilli paste then little lime juice at a time to dilute the udang petis. Then mix every together. Mix the dress with the salad ingredients. Hi, I came to your blog from Beachlover's My Asian Kitchen. Love rojak too. 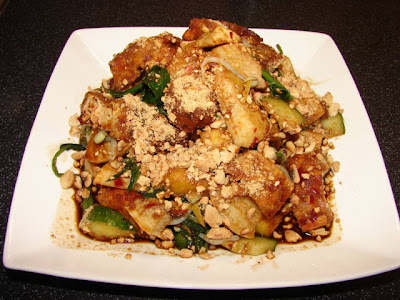 Can you get the Penang style rojak sauce in England? I don't think so. The Hae Ko (petis udang) is the vital ingredient which make up the rojak sauce. This brand Jeeny's as shown on my post is the only one I have seen in England. You will have to smuggle the good stuff in if you are coming back from Penang. This Jeeny's hae ko is not bad, better than nothing. If you like it very thick, use more of the paste and less lime juice/ tamarind juice or alternatively boil the sauce to reduce it to a thick paste. This makes my saliva flows! My favourite snack whenever I am back in Malaysia!